If you scan for the first time, you should at first scan some pages for testing purposes. Thereafter, you check your e-mails at an internet computer and ensure that the scanned document was sent to you successfully. The scanners are intended for mathematical content only. Please do not turn of the scanner or the computer nearby. Generally, you are not allowed to scan objectionable or illegal content in the library. Please observe the effective German laws. Please enter your e-mail-address for scanning The completely scanned document will later on be sent to your e-mail-address. Therefore, it is important not to mistype your e-mail-address. If you discover the screen not in the state shown above, please reset the computer by pressing the shortcut Ctrl + Alt + Back to the initial state. Flachbett/flatbed: Appropriate for scanning books and journals. Please place the document on the scanner's glass surface area. 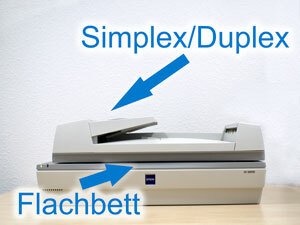 Simplex/simplex: Appropriate to scan single sided printed Din-A4 paper. Please place the pages in the scanner's document feeder with the printed side up. 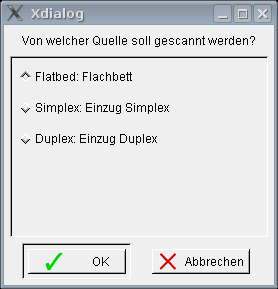 Duplex/duplex: Appropriate to scan double sided printed Din-A4 paper. Please place the pages in the scanner's document feeder with the first side up. Which resolution should be used for scanning? You can choose between a resolution of 150 dpi, 300 dpi and 600 dpi. Normally, the choice of 300 dpi is appropriate. If you are not familiar with this, keep the default choice. Scan in color? Choose if the document shall be scanned colored or black and white. Scan one more page? If you have chosen the source Flachbett, you will be asked if you want to scan some more page after the scanning of the first page. If you affirm this, another page will be scanned. Therefore, page the scanned document forward one page and affirm thereafter that you want to scan another page. Scan successful - a mail was sent to you! View the scanned document? Congratulation! Your document was scanned successfully and (automatically) converted to a PDF-file. You will be sent an e-mail containing a link to the scanned document. You can view the scanned document and check that it was scanned as requested.